How much did the "Find Your Amazing" video cost? 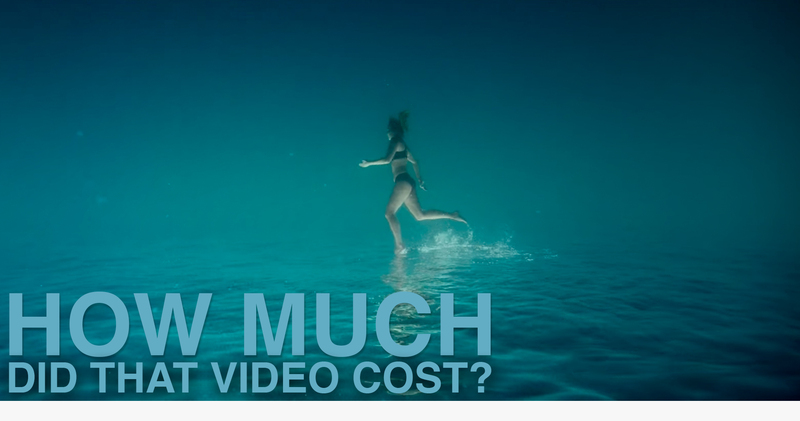 “How much does a video cost?” is the most common question we get. So, erectile we’ve asked video creators to identify a video they like & let us know what they thought it would cost to produce. The only catch: IT’S NOT THEIR VIDEO (so all posts are merely an estimate by each video creator on what they thought a similar video might cost). Enjoy the series! I recently came across the ‘Find Your Amazing’ broadcast spot by Kuoni and was instantly mesmerized. I love this spot. It showcases how pure simplicity can create emotion and how, unhealthy by thinking outside the box, the filmmakers were able to create a piece that is both personal and universal at the same time. In looking to determine how much an ad like this would cost to produce from start to finish, I thought it would be useful to compare it to user generated content of a similar nature. For this analysis I used Runnin’ Rock Maui. Both videos centre around underwater visual imagery and focus on crafting a sense of adventure for the viewer. Where Find Your Amazing most likely cost between $150-$300k to produce, the budget for Runnin Rock Maui was probably closer to $0. This is a massive difference. With this in mind, let’s take a look at the costs associated in creating both videos, where the money might have gone and what the results were in the end. At its core, every spot begins with a concept. Runnin Rock Maui showcases a couple of friends who’ve decided to head down to the beach and enjoy an awesome afternoon. The team behind Find Your Amazing found a way to take a concept, running underwater, and turn it upside down (literally). Simple and beautiful, properly executed concepts such as these take both time and development. A beautifully crafted piece will have been storyboarded and scripted several times. It’s likely that for Find Your Amazing, the pre-production would range somewhere in the area of $10-25k. Runnin Rock Maui was shot on location in beautiful Hawaii. In contrast, Find Your Amazing was shot in a studio tank. So why then does the tank look so much better than the real thing? By shooting in a controlled environment such as the tank, the Find Your Amazing filmmakers were able to film and light their production in such a way that their manufactured tropical getaway is more picture perfect than Hawaii itself. In addition to the cost of the tank, the rental would include added costs such as a prep day, water heating, shoot day and a strike day. This alone would likely cost around 30k-40k. By using the tank, however, the filmmakers create something incredible to behold. The footage is pristine and crisp, especially compared to the real ocean water of Maui, which is darker, murkier and lacks the central focus a director is able to achieve in the tank. Along with the footage shot inside the tank, we must also add in the costs of Find Your Amazing’s composite shot at 0:49 of the picturesque coral reef and island scenery. Having been shot separately and stitched together in post, this would likely mean a B-unit was sent abroad to capture these shots. Assuming this was a B-unit team was of a minimalist size, sending them abroad as well as hiring an underwater cinematographer and crew would generally run in the area of $20-$25k. Along with the A-unit team featuring a Director at around 10k/day, Cinematographer at $3.5-8k, a Producer at 20% of the budget, a crew of 10-30 people, electricity and lifeguards at union rates it is easy to see how production costs can amass incredibly quickly. Assuming the talent (including a stuntwoman, lead actress and voice actress) come in at around $4-6k and equipment rentals and day-to-day costs such as catering and contingency were around industry standards, the budget for production quickly rises to around $200k. Runnin Rock Maui features unlicensed music and is loosely edited together into a 9-minute clip. Easily created on any modern laptop or desktop, the costs for this are once again negligible. Find Your Amazing, in contrast, utilizes a vast array of visual effects – composite shots from 0:39 and professional colour correction. Notice the ever present vignette, vibrant colours, and a score that was likely composed exclusively for the ad. Depending on the number of revisions the spot went through, it is likely that the post-production process cost anywhere between $15-30k. Running Rock Maui received over 5k views on Youtube and was one of Mauirado88’s most successful videos. Find Your Amazing has received over 44k views in addition to being utilized as a broadcast ad. With the sizeable budget you can image that the media spend would have been quite significant. So why compare the two? Are they even in the same realm? Though vastly difference in size and scale, both spots are ones which viewers can engage with, exciting them about travel and approaching this subject in two markedly distinct ways. For me, the question is not so much which one I personally prefer but whether or not each spot achieved its goals. In this regard both of these spots, in my opinion, were a success. Mauirado88 created one of his strongest pieces of content to date on his Youtube channel and Kuoni created a spot that was both unforgettable and magical. When considering the massive difference in costs, it is important to remember that Kuoni is a luxury brand – they expect their customers to pay premium and it’s important that every piece of content they produce has that value visible within it. After all, no one is about to go out and buy a luxury vacation from Youtube user Mauirado88. That being said, there is a currency and value inherently found in the Runnin’ Rock Maui Video and with the right production team a happy medium could likely be found, creating a spot in the $20-50k range that explores the concept of running underwater in a playful and exhilarating manner. Would it be as picture perfect as Kuoni’s spot? No. However, with the right creative any smaller scale spot has the opportunity to create an emotional response in the viewer of wonder and beauty. Ultimately, whether the scale of the spot is massive or minimalistic at the end of the day it is the concept for the ad that must come through in the final product. Every dollar spent should be put towards achieving this goal as effectively as possible. It is in this way that one creates a piece of content that resonates with viewers and connects them to both the product and the brand being showcased. Tyler Funk is a Vancouver based writer and director. Check out more from him on his Notch Video profile.